The municipality of Elios Pronni is located in the southeast of the largest of the Ionian Islands, Kefallonia. Beautiful and fertile, the island is blessed with some of the most dramatic scenery in the region. Mount Ainos (1628 m.) dominates the south of the island and has been declared a national park. Its tall fir trees (abies cephalonica) are unique to Kefallonia and a small number of wild horses still roam the woodlands. Excavations have established that there were settlements on the island as far back as 50,000 BC. By the seventh century BC, Kefallonia had four principal towns, Krani, Palli, Sami and Pronni. The remnants of all four have been excavated and a number of Mycenaean beehive tombs indicate that the island was of great importance in antiquity. Poros, which is believed to have been the port of ancient Pronni, is today a picturesque seaside resort set in a rocky inlet. The little harbour has ferry connections to Killini on the mainland. The jagged coastline to the north and south provides shelter for the endangered monk seal (monachus monachus), while the blue water sends out a clear invitation for swimming off the rocks. There is also a long pebble beach stretching to the north of the village. Local attractions include a large, well preserved Mycenaean burial chamber discovered outside the nearby village of Tzanata. Excavated in 1991, the circular underground vault is believed to be the tomb of a great myceanean chieftain. The Drakaina Cave, situated on the south side of the Vohinas gorge, is thought to have been used as a cult site, probably dedicated to the worship of the Nymphes. The wide valley around the small fishing village of Katelios is of extraordinary natural beauty, with lush vegetation and the remains of old water mills. 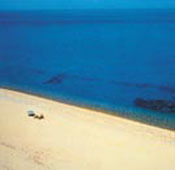 Among the attractions of Katelios are its long sandy beaches and a good tourist infrastructure. Visitors to the area can witness an extraordinary phenomenon on August 15, on the feast of the Assumption, at the church dedicated to the Virgin in the village of Markopoulo, when small snakes with a black cross on their heads suddenly appear and fill the grounds. The villagers believe that their appearance brings good luck. By the next day, the snakes have all mysteriously disappeared. The popular resort of Skala at the southern tip of the island has some of the finest beaches in the area, framed by tall Kefallonian pine trees. Not far from Skala are the remains of a Roman villa, where excavations have revealed baths, inscriptions and two very well-preserved mosaics. Nearby, are the remains of the pillars of a 7th century Doric temple, which was later converted into the little church of Saint George. 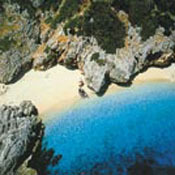 The southeast of Kefallonia is one of the loveliest parts of the Ionian Islands. There is literally something for everyone. Sandy beaches, which are among the last nesting grounds in the entire Mediterranean for the endangered loggerhead turtles; picturesque fishing villages where visitors can soak up the local colour; and inland, spectacular scenery and interesting archaeological and natural attractions. Although it is not overdeveloped, the region also has a good tourist infrastructure, with modern hotels, traditional tavernas, friendly bars and plenty of shops. Good roads make it easy to explore the entire region by car, moped and for the more energetic, even on foot. Wherever they choose to stay in the area, visitors will never be far from sublime tranquillity and fun-filled evenings. All this and much more ensure marvellous holidays that will be further enriched by the friendliness, spontaneity and warm hospitality of the local people.